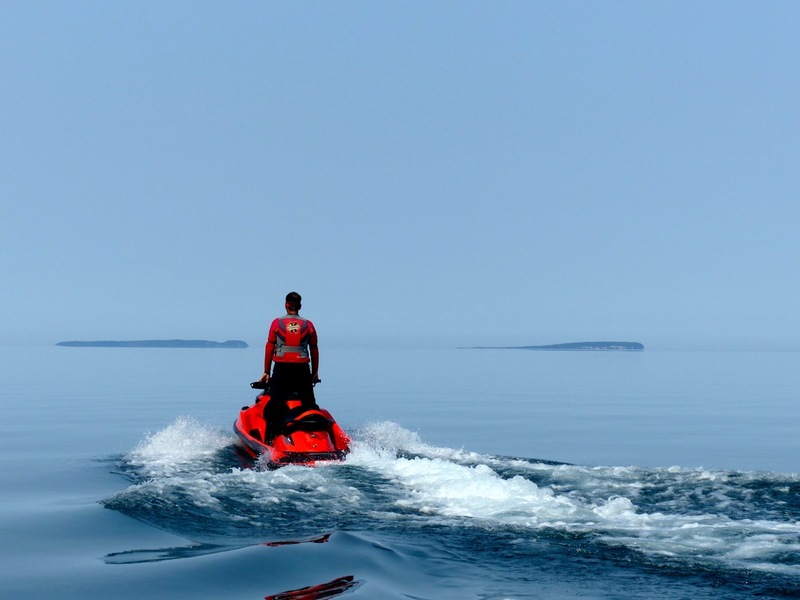 How do you avoid getting lost on a Sea Doo tour? 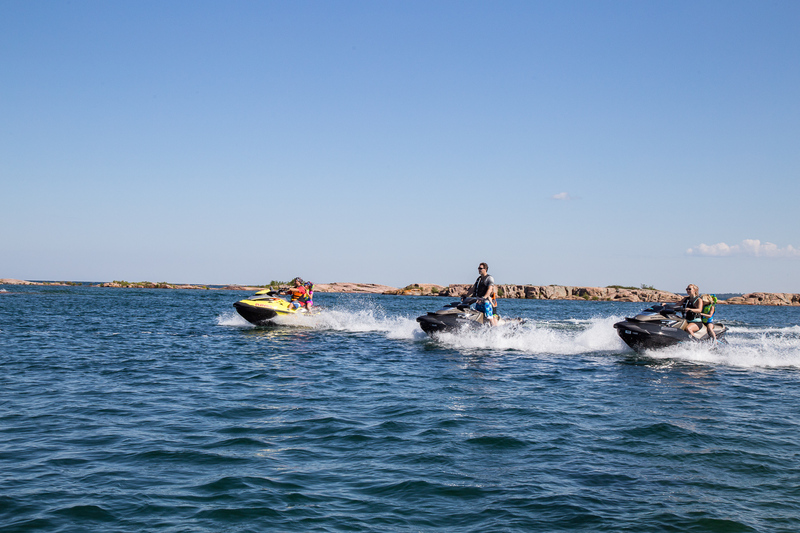 Too many personal watercraft riders stick close to home for fear of losing their way on the water. This concern is understandable for the inexperienced, uninitiated and unprepared. That’s because, unlike with other recreational powersports, there is no trail network. There are no directional signs or intersection maps. Just wide open waterways that seem to stretch to the horizon or meander in every direction. Before long, everything seems to look the same. That’s why doing a little prior homework can save your day. It’s easier to avoid getting lost if you stick to popular inland waterways closer to populated areas. These tend to have more cottages, people, services and traffic than wilderness water bodies. So this article assumes that’s where you’re riding. Which doesn’t necessarily make them less intimidating or unfamiliar to you. Just more straightforward to deal with. Crossing huge water bodies like the Great Lakes or riding saltwater takes a whole other level of skill and expertise that are beyond my scope here. 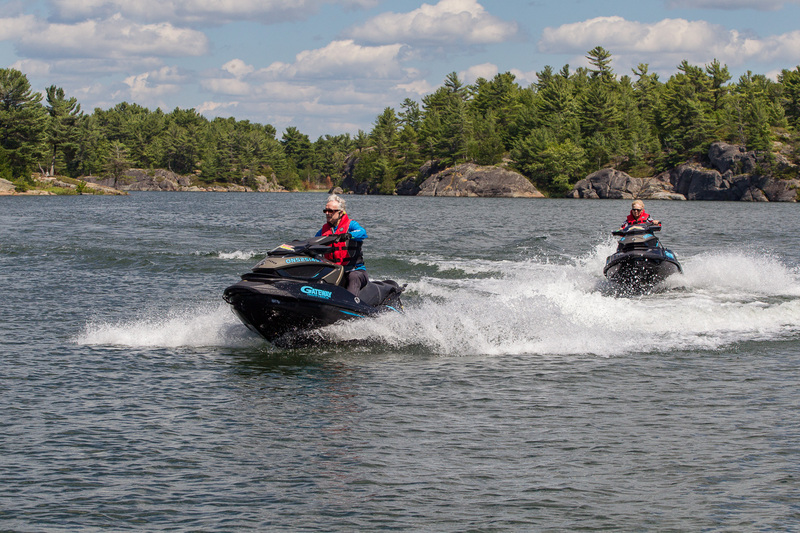 Generally, there are two kinds of getting lost on inland waters. One is where you’re totally disoriented and have no idea where you are or which way to go. The other is when you’ve got a pretty good general idea where you are. But have momentary uncertainty about what the exact route choice to make is. A wrong choice here can lead to number one. But if you’ve done your homework before leaving home, odds are you won’t experience become totally lost. If you do, I recommend asking someone for location and direction advice immediately (see tips below). Today, you can help yourself avoid getting lost with various navigation and locating devices. Many riders find their way with various apps like Navionics or navigation devices like Garmin and Lowrance. But I rarely use electronic support. I prefer to rely on some tried & true, low tech, way-finding techniques. Of course it helps that I have a good sense of direction. When in doubt, I consult the GPS based compass integrated into the gauge of my Sea Doo GTX 155. The compass gauge shows the cardinal direction points (N, E, S, W) and the intermediate cardinal points (NE, SE, SW, NW). It also indicates my present bearing among these points in degrees (example: 185˚). All of this is useful, especially if you have the other way-finding basics covered. These way finding basics to avoid getting lost include always riding in daylight. This means planning your ride in advance. And always being aware of the time of day so you arrive at your destination before the sun goes down. Certainly on sunny days, the sun itself can assist to reaffirm your general sense of direction by its position in the sky. Another way finding basic is that no matter who’s leading, every rider watches carefully and maintains location awareness. After all, you never know when you might have to help your group find its way. Or complete a ride on your own. Like if you get separated from your group. Or the leader can’t complete the ride due to a breakdown. Besides, if you learn the way as you go, you’ll be better equipped to do the ride again with others. Finally, another basic to avoid getting lost is to slow down. Zipping along on a PWC, it’s easier to lose your way. Don’t be afraid to cruise slower if you’re uncertain about where to go. Or to stop and powwow with your companions or consult a map or device. In preparation for any new ride, I do some research. Usually, I start with a road map or Google maps. Strange as it seems, I find that locating the intended waterway helps orient me as to its general direction and position relative to neighbouring towns, highways, power lines and railways. From this review, I also get a better sense of distances and start & finish points relative to land. Earlier, I suggested there were no delineated trails on the water. This isn’t exactly the case. First, there’s the shoreline. It defines the shape and position of the waterway. On major water bodies the shores may be too far apart for each one to assist in navigation. But keeping one shore in sight is generally enough to help guide your way. Obviously, shorelines are even more helpful while river riding where both are usually in sight to help mark your way. Mind you, shores can be deceiving. They can meander away, be full of dead bays or false channels. Or be dotted with many islands that can be difficult to distinguish from mainland. But it’s hard to get hopelessly lost when both shorelines are generally heading in the same direction. Using shores as guidelines while riding is why it’s smart to learn the relative shape and orientation of each waterway before you ride it. Is it totally linear? Round? Long & narrow? Is it relatively straight or very meandering? 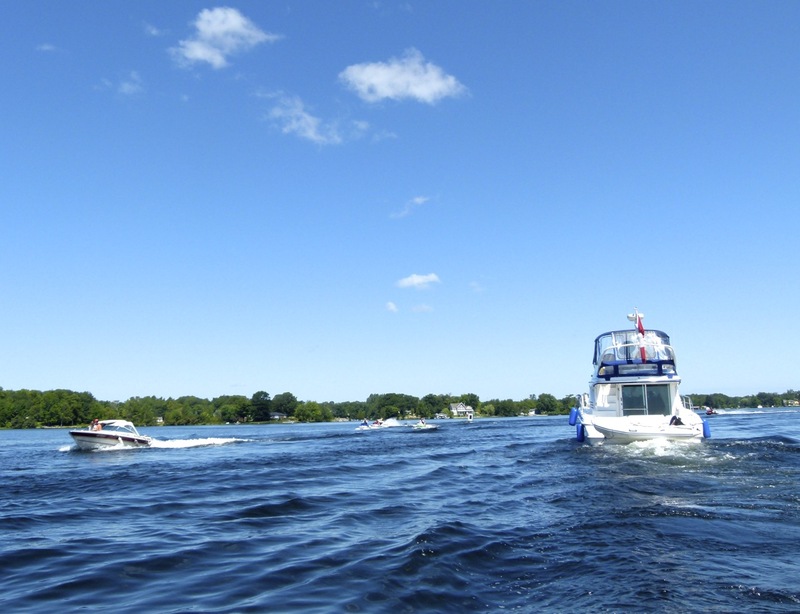 The second and most important factor that helps delineate your way on the water is navigation buoys. On larger water bodies and well-travelled main routes, these are universal marine markers. They are placed and maintained by an agency like the Coast Guard. 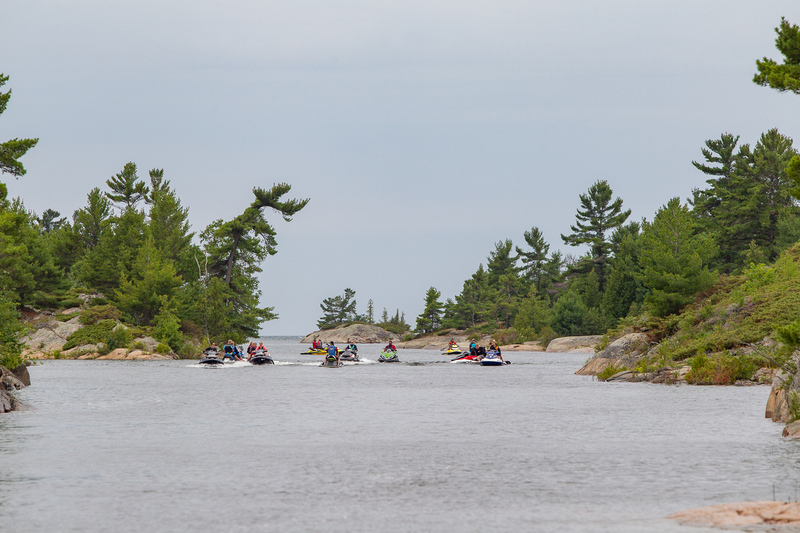 But sometimes municipalities, cottager associations or marina operators place additional markers locally to mark secondary channels, routes or rocks. Typically, the former show on nautical charts, the latter do not. The universal navigation buoys are normally sequentially numbered along the route ahead. 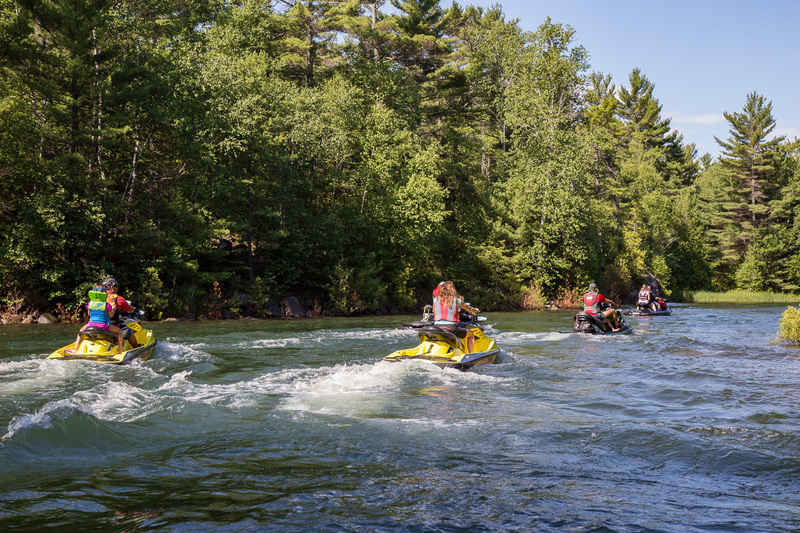 The numbers increase as you head upstream or away from open water. These numbers help you identify which buoy you’re at and also appear on marine charts. Always stay between the green (flat top/odd numbers) and red (pointed top/even numbers) buoys. 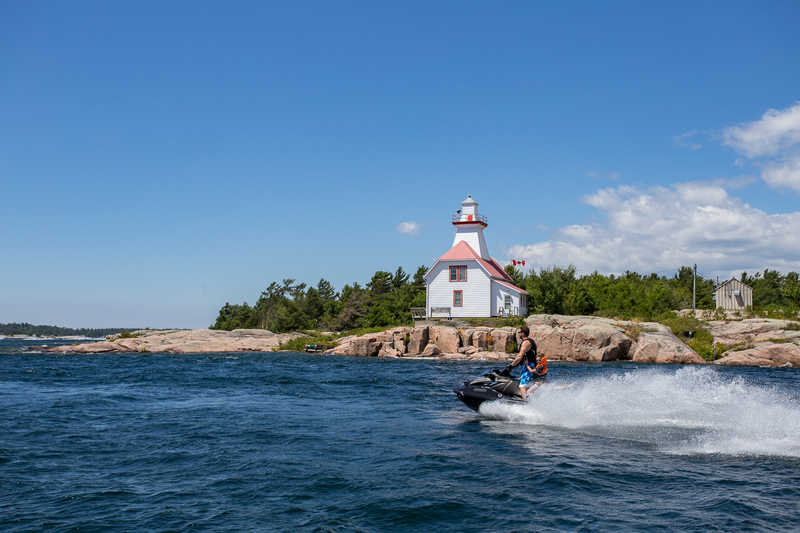 If there’s only one buoy in sight, remember the “Red Right Return” rule and stay to the proper side as soon as you discern its colour or shape. 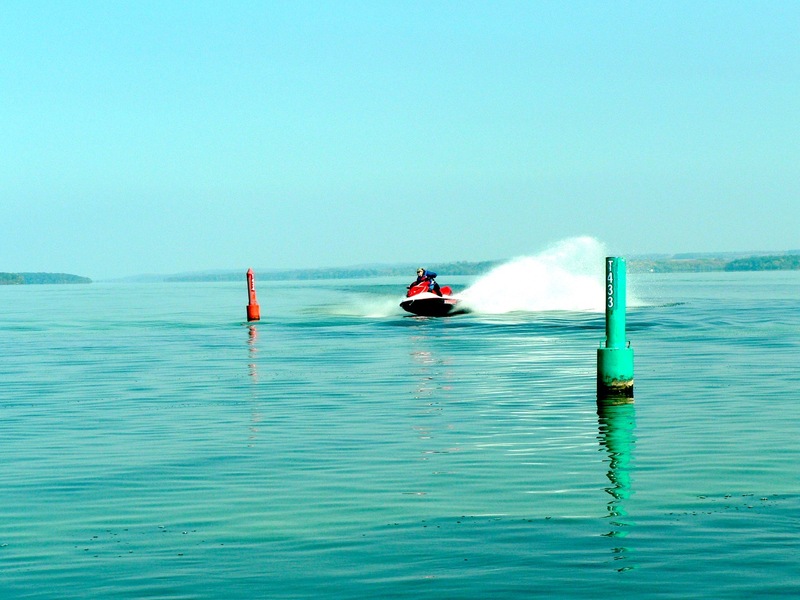 Red Right Return means that when you are riding towards the source of the waterway (known as “headwaters”) or away from open water, keep the red buoys on your right (starboard) side. Generally, if you are going against the prevailing current, you’re heading upstream. Obviously, the opposite is true going the other way, so red buoys are on your left. This Red Right Return rule will also assist you in way finding. For instance, let’s say your outbound journey is upstream (returning toward the headwaters) and your inbound is downstream (away from the headwaters). Then any red buoys should be on your right when you go and on your left when you come back. If they aren’t, you need to double-check your location and direction. Prior to riding, I’ve often studied the buoys on marine charts, noting their numbers. Then I know, for example, that at buoy #N92, I have to make a sharp right into a poorly marked back channel, detour or shortcut. Or at # N49 to turn off into a marina. Knowing whether the buoy numbers are ascending or descending can also be helpful if you do become disoriented. 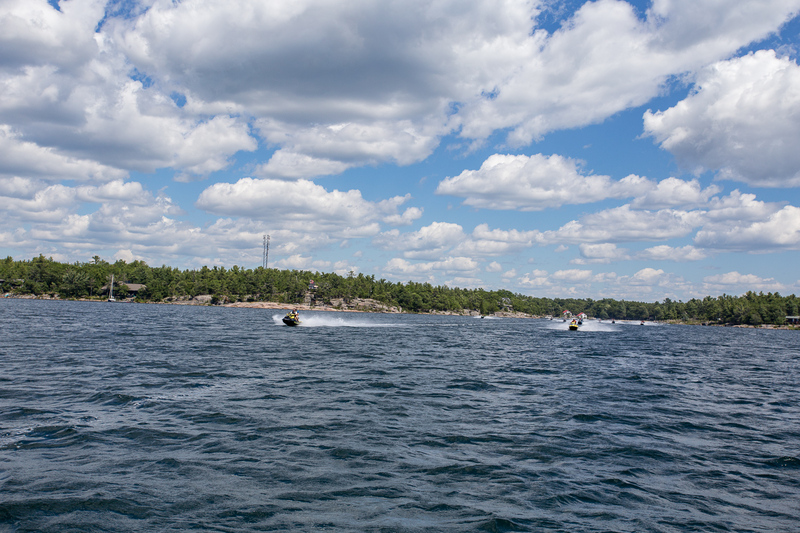 When you see the buoy line again, numbers can assist in determining which way to go, upstream or down. But navigation buoys aren’t always present. That’s when you need to rely on other way finding tips. The first is to memorize key landmarks. Or snap a quick photo on your smart phone. A landmark can be anything that stands out from its surroundings and is easily identifiable on your return. Like a lighthouse, unique building, weird rock, bridge, power line or water tower. Landmarks are especially handy to help with returning to your launching point, when all the distant shoreline typically looks the same. My second way-finding tip is to follow other boats. At least on major routes, the big runabouts and cruisers generally know the way or have the navigational apparatus to find it. So if you see several boats headed the same direction, chances are they will help keep you on course. Even when there’s no large boat in sight ahead, I’ve frequently followed its “trail “of disturbed water or cavitation wake to get where I’m going. My final tip is simple. Don’t be afraid to ask. 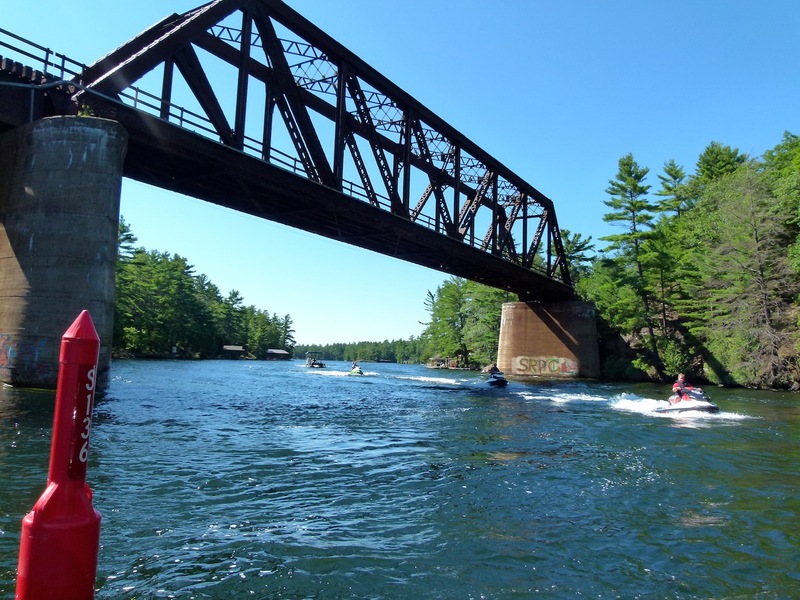 From other boaters and cottagers, to anglers and marina operators, there are plenty of folks who know exactly where they are. And will be only too happy to help you get back on course. Finally, here’s some more important advice to avoid getting lost. Keep your riding group together and don’t let anyone get separated. Know how many are in your group. Watch your mirrors to make sure the riders behind you don’t suddenly go missing. Stop and re-group frequently. If someone’s not there, go back and find them. Everyone is responsible for everyone else so you all leave and return together. Above all, use common sense. React early if you start to have any inkling that you’re off course. Reassess your location, direction and distance travelled, then decide which way to go. Odds are very good that if you’ve taken my advice to heart, you’ll get where you need to go.